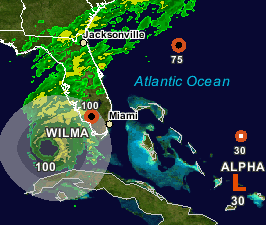 I’ve been keeping an eye on Wilma using the ESRI hurricane tracker mostly because I have many friends in the Fort Myers, FL area. Anyway I just noticed something on the tracker that made me look twice. In the event that more than 21 named tropical cyclones occur in the Atlantic basin in a season, additional storms will take names from the Greek alphabet: Alpha, Beta, Gamma, Delta, and so on. I wonder if this happens again next year if they will start naming the second batch of storm names. Amazing how quickly this has spun out of control. I’ll take the 120 degree days here in the summer over a hurricane, blizzard, earthquake, tsunami anytime. Hopefully when I wake up in the morning not too much damage will have been caused by Wilma. Good luck Florida.